November « 2014 « Team Little Owl Foundation - Dedicated to raising awareness and keeping up the fight against childhood brain cancer. I don’t save many things. I have a fear of hoarding and a good purge has always done wonders for my mood. And, yes, I threw away many things Allie made or colored long ago when I thought she was healthy. I wasn’t going to be that mom that held on to everything and lived in the past. I do have a purple bin with a few of Allie’s projects in the basement that I will always keep. But even after Allie’s death, I don’t sit in the basement looking at her artwork. Even the thought of it makes my anxiety rise. I have to be able to breathe. I’ve changed a lot over the past year and a half, but I still don’t save everything that Evie creates. Evie loves to write and draw, and she brings home ten things a day. I filter most of it, and it’s almost comical now when Evie sees her latest masterpiece in the recycle bin. She’s not the least bit surprised. It’s almost expected at this point. But I did save a turkey feather that we created as a family when Evie was in kindergarten. I came across it last month as I was pulling things out of our storage room to prepare for Allie’s Sale. I wasn’t just looking at something that we made two years ago. I was looking at a life that belonged to someone else. A life that I am so jealous of and would give anything to have again. 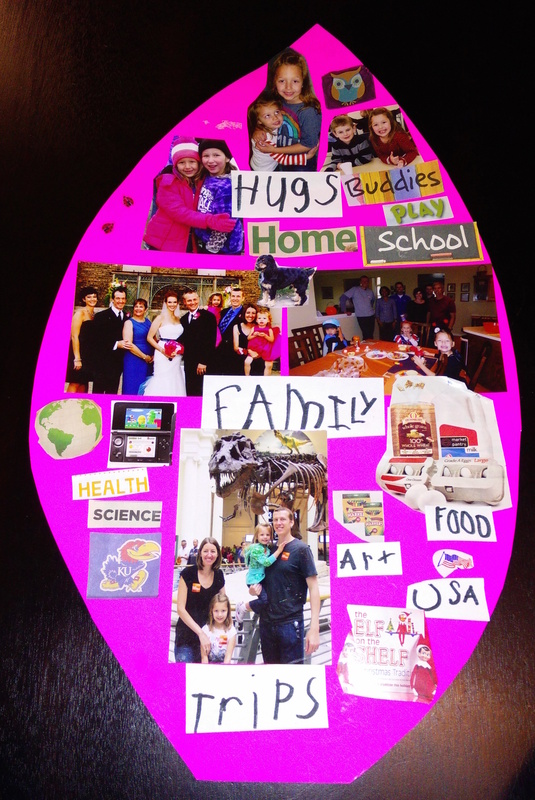 The assignment was to put things on the turkey feather that we were thankful for as a family. I remember Evie choosing most of the items that went on there…the Nintendo DS, the Elf on the Shelf, and the art supplies. We put pictures of Evie with her friends and family and one of Evie and Allie hugging at the top of the feather. We put other things that we were thankful for too such as trips, home, food, the earth, school, USA, KU, and science (Kyle’s contribution). Oh, and there’s a picture of our dog, Meeko. Evie’s feather was finished and ready to be turned in when we remembered that we still had a dog. We felt bad that we forgot poor Meeko and stuck him in the middle of the feather as our apology. There is one word that surprised me when I saw it on the turkey feather. Health. Over the past year and a half, I have kicked myself a million times for taking my healthy girls for granted. But somewhere before being shoved into a world of childhood cancer, we had appreciated our health and stuck it on the feather. It brings me a little relief to see that word on there, but I still know deep down that I was never thankful enough for this gift. Allie’s contribution is on the feather as well. There is one single owl sticker near the top of that photo of the girls hugging. That is the closest Allie got to having a kindergarten turkey feather. Next year, Allie’s friends will decorate kindergarten turkey feathers with things that they and their families hold dear. But this was it for our family. We didn’t know it at the time, but we would only get to do this once. Sorry Meeko, but I can’t imagine a more perfect feather than that.